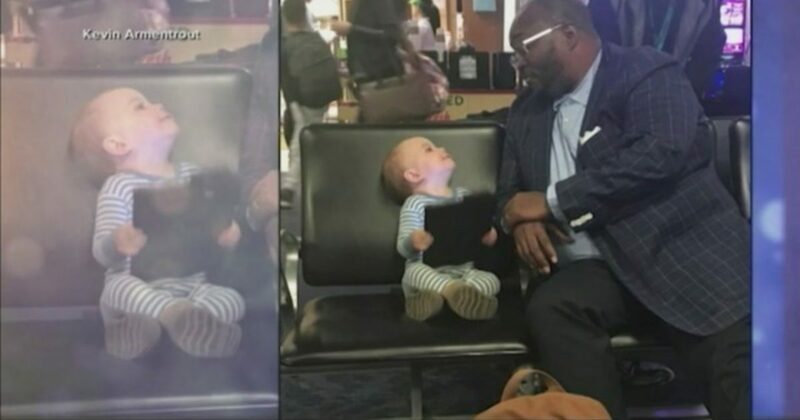 It seems like airports have become one of the prime locations for beautiful moments between strangers captured on video that go viral. Whether it’s singing or dancing at the gate or comforting a nervous mama flying solo, it seems that while air travel can often bring out the worst in people, it strangely seems to bring out the best in others. But this latest airport-moment-gone-viral video is just too much. Author and motivational Kevin Armentrout was traveling with his wife and 16-month-old recently and the parents were a little nervous about how the little one would fair in a big airport. They decided to let her toddle around for a bit, where she promptly made friends with a middle-aged businessman and spent 45 minutes eating snacks and watching cartoons with him. One of the most wonderful things about small children is that they remind us how easy it is to make friends, something we lose the sense of as we get older and more guarded towards strangers. There’s always room to be a little more friendly and a little more kind in this cold-hearted world.